Weeks off are very few and far between for us down in Ecuador these days. For the 2011/2012 season we have exactly ONE week off which happened in the beginning of December. So, we knew we had to take full advantage of it and enjoy our free time while we could! Don lending a little perspective to the low water on the Rio Pusuno. At an ideal flow, you would be able to boof off that giant block of rock in the center of the photo in between the slot on river right and the trickle of water on river left! 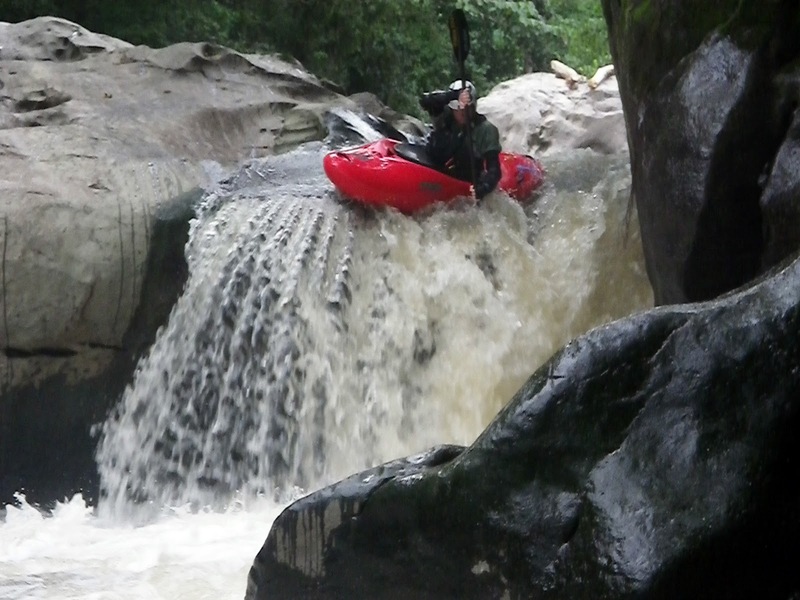 We all love guiding and showing people down the rivers of Ecuador, and we all love kayaking. People asked us if we were going to sleep in and relax and catch up with office work on our week off and we said, hell no! We are going boating! Darcy on the lead in rapid above the falls. Had this drop been anywhere else we wouldn’t have even batted an eye; but since it was about 30 feet above the lip of the falls it was a little nerve wracking. The left shore was totally undercut and the right shore and a mini sieve and log in it. Middle was the place to be! Luckily it was pretty easy to get there. Don and I started the week off with a trip down the Pusuno River near Tena. We have been skunked so many times before on this run and we were feeling lucky as we left Borja in the early morning hours and drove to the put in. Our sense of luck was false it would turn out and we arrived to the put in to find really low water despite recent rains. But it’s a darn long drive to the put in and we’d been turned away 3 times in the last 2 years and so we decided to just go for it. We thought it would be an interesting experiment to see how the river was at a silly low flow. Darcy on the Pusuno Falls. Don got a cool, funky angle by laying on top of the ledge above the falls. We had to walk most of the drops leading up to the waterfall. Someone who didn’t mind boat abuse could have run 1 extra which was about a 15 foot drop where you boofed the 1st five feet, landed on a shelf of rock and then could slide the rest of the way down. The big waterfall itself was great, although it didn’t exactly feel great upon impact! The waterfall plunges roughly 40 feet into a beautiful amphitheater of rock. The Pusuno rock is much different than most of the other rivers in this area. It’s a layered limestone canyon—very tight and in tact above the falls and very shattered below the falls. Once you leave the plunge pool (you’ll want to hang out there for a little while as it’s a really special place) you’ll find yourself in a land of sieves. The happy couple below the falls…ok, well somewhat happy couple. I was a little peeved at Don because his job was to bring the water and he forgot. I was wearing a drytop in the tropics (my fault, I know) and we had about 4 ounces of Gatorade between the 2 of us. I’d like to think it was my dehydration making me cranky…and it’s not just that I’m a biaaaatch! In the lower section of the run, big hunks of this limestone have fractured off the towering walls and landed in the river. The lower river bed is made up of pieces of broken off rock ranging in size from a small dorm-room refrigerator to a large house. It makes for some really cool rapids, but it also creates an incredible number of sieves. My advice for this section would be, boat scout with the utmost caution! If you can’t see the exit, it’s probably because there isn’t one! This is the rapid directly below the falls and is indicative of things to come for the next 5 or so miles. All and all the lower section was much better than we were anticipating with the low water. Don only portaged 3 times and I portaged 4. Again, someone willing to take more boat abuse could have run 1 more rapid. 2 of the rapids had zero water flowing above ground for the exits. Sorry the shot is blurry but it’s one of the only ones from the lower Pusuno. This was a sweet boof around one of the many giant boulders. When we weren’t portaging sieves, there were some quality drops on this section of the river. Next we were off to meet up with Larry to check out the Suno River near Loreto. I’d never been to Loreto before (never been past the Huaturacu River on the Tena-Loreto-Coca road) and so just seeing the new area was exciting! People have paddled the Suno before but it is unclear which sections have been run. We spent a lot of time asking around Loreto about access roads and such and then finally found the right guy who pointed us towards El Progreso (an ironically named town) and the end of the road that goes up river left. The road follows the river, but in the upper sections it follows the river from thousands of feet up. We made our way to the end of the road where we met a nice family who said we could use their trail down to the river. The woman said it only takes her 15 minutes to get down to the river. She took one look at us and said maybe 20 for you. After 40 minutes, we reached the river! And we are no slouches when it comes to carrying our kayaks around. But, we were still no match for the Ecuadorian mom in her gum boots! It was an awesome jungle trail complete with Guans (a beautiful wild turkey-like bird), steep muddy walking and a cool forest experience. The family who lived where we hiked in said they’d never seen any kayakers before. I think the road is newly finished to their place so that would make sense. If you are reading this and have paddled the Suno before, please post a comment on your access points, etc…we’d love to find out more info on this place! We only paddled the upper section so are interested in how the lower run is. The 3 amigos on the shores of the Suno after the hike in. I’m lucky to work with, live with and be best friends with these guys. Good company is part of what makes my Ecuador experience so special! The run wasn’t overly challenging, I’d say it is Class III+ with a little IV- and all boat scoutable. The special part about the run was how incredible the scenery was. There were huge trees along the river banks and pristine rainforest as far as you could see. Loreto is very out of the way to pretty much anything, but if you are in Ecuador for a long time and want to see a new part of the country, it’s worth the trek. You can bus to Loreto then find a local taxi driver to take you up river left to El Progreso then beyond to the end of the road. Start hiking here! After the Suno, we headed back to the Quijos where we woke up to find our home river at 8 on the gauge. We all hopped in at the lodge and paddled the Borja Run, El Chaco Canyon, Bom Bon Canyon and all the way down through Gringos Revueltos and the Lower Quijos. El Torro rapid was HUGE and really fun! Sorry, no photos…we didn’t get out of our boats once in the 24 miles from our lodge through the Lower Quijos! Larry and Don relaxing on the streets of Loreto, drinking a beer and guarding the maxi pad section of the store. With the exception of 2 weeks so far this season, we’ve had lots of rain and really awesome water levels. While all this water trumped some of our plans for exploration this week, it made for some other fun times around our home rivers. Local Chiva bus. By far the best way to travel around the hot areas of Ecuador! Giving up on the runs we wanted to do if we had low water, we headed a bit north to enjoy the high water on our local rivers. It was a great week off! Tiring, but refreshing at the same time.